SEOUL, July 18 (Yonhap) -- Seas surrounding South Korea are being plagued by sea desertification that depletes seaweed from bedrocks, an environmental disaster accruing from global warming and marine pollution, with some 19,000 hectares of sea forests entirely petrified. Worse, the deforestation that eventually causes sea plants to disappear, is continuously progressing at a too-fast pace, with its increase rate posting 27.1 percent annually. According to the Korea Fisheries Resources Agency (FIRA) Tuesday, 62 percent of the nation's east coast, 33 percent of the south coast and 35 percent of littoral sea off the country's largest Jeju Island have been desertified. Filled with abundant marine alga like sea mustard and kelp, sea forests are critical to the marine ecosystem by providing spawning and living grounds for many kinds of fish as well as food for them. But the forests are being rapidly blighted worldwide with global warming and marine pollution these days. 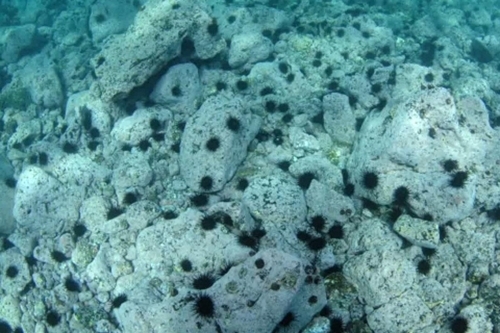 Moreover, calcareous alga like sea urchins and gastropods are accelerating petrifaction by gobbling up sea plants. 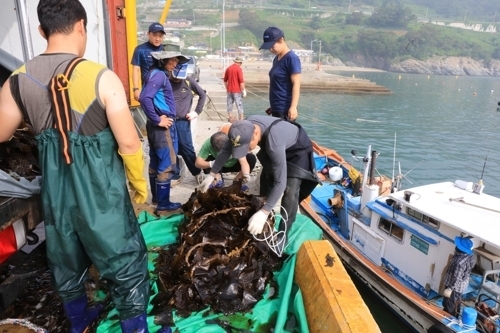 In South Korea's case, the marine lapidification has moved north from Jeju to the eastern coast since the early 1990s, and finally landed on the southern coast in recent years. The destruction of marine ecosystems has resulted in the depletion of fisheries resources and subsequently led to sharp drops in catches. According to a fisheries information website being run by the Ministry of Oceans and Fisheries, the haul between January and February dived 17,414 tons to 134,982 tons from a year ago. "The sea desertification is expected to become more serious down the road, and measures against it are urgently required at a state level in order to protect fisheries resources and increase fishermen's incomes," said Rep. Wi Seong-gon, who raised a question about the disaster at a parliamentary interpellation last year. Advanced countries, including the United States and Japan, have long been trying to overcome the environmental calamity by creating sea forests since the 1980s. 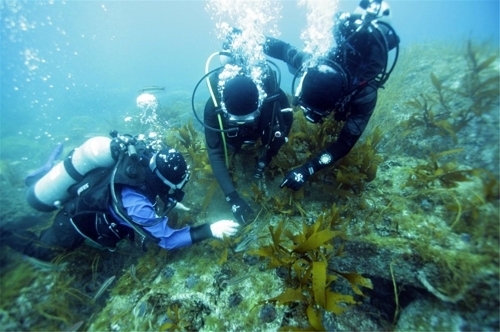 On its side, South Korea, which designated May 10 as the Day of Marine Planting for the first time in the world in 2012, has also been trying to awaken people to the gravity of desertification and the importance of restoring sea forests. The ministry, which launched a project to create such forests in 2009, created 12,208 hectares of forest as of the end of last year, and plans to make 54,000 hectares of forests by 2030. The ministry is currently making use of two kinds of methods in restoring coastal ecosystems -- the spore bag method and floating rope method. The widely used spore bag method places bags containing mature seaweed spores in a place where the deforestation is underway and let them cling to rocks to survive. The floating rope method lowers ropes festooned with seaweed into the sea, effective in preventing sea urchins, squirts or abalones from eating them. In addition, the ministry plans to build 26 sea ranches this year for the recovery of fisheries resources.